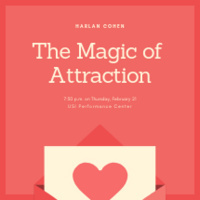 Join Housing and Residence Life and Harlan Cohen to learn how to find the love of your life in college! Attendees will be entered to win a movie date night prize pack (TV included) and a picnic date prize pack (hammock included)! I loved this presentation. I learned so much from it. I think Mr. Cohen brought a fun approach to a topic that can make people uncomfortable.